Financial said the "no need to fear of decline in the value of the dinar at the current stage because internal factors can be controlled. The economist said Majid picture that "there are no objective reasons to fear of falling value of Iraqi dinar at the current stage, pointing out that" the factors that possible to affect the dinar exchange rate is and internal factors can be addressed through "cash reserve sovereign." The picture "that if there was significant inflation as a result of external causes will be forced government or organizers of the Iraqi Central do a strengthening exchange rate of the dinar against the dollar, which would result to fight inflation and reduction, as well as having other mechanisms lies in the withdrawal of surplus from the Iraqi dinar rolling in the domestic market in order to ease the process of inflation and the accompanying rise in prices of goods and commodities. For his part, Director of the Economic Media Centre Dergham Mohammed Ali "that the value of the Iraqi dinar did not fall against the dollar and foreign currencies and that Iraq was able to maintain a fixed exchange rate against other foreign currencies. 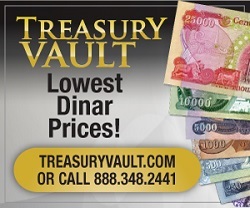 Explaining that the cash value of the dinar did not go down if what has been equated with the exchange rates of foreign currencies and the reason behind it is the Iraqi Central procedures to maintain the fixed exchange rate of the Iraqi dinar. " Pointing "that inflation continued increased rate in the recent period led to a decline in the value of the dinar and affected purchasing power." In the meantime revealed a member of the parliamentary economic committee Salman al-Moussawi that the decline of economic development in the country contributed to the decline in the value of the dinar against the U.S. dollar. The al-Moussawi said in press statements that "the power of the Iraqi dinar and monetary value depends on the strength of the country's economy and the extent of recovery sectors generating income and not on the auction CBI, he says. Pointed Moussawi to" The value of the Iraqi dinar does not depend on what is sold at auction CBI but value of the dinar lies in the strength of the country's economy all segments of industry, tourism, commercial and agricultural, pointing out that "these sectors whenever possessed elements economic power and income-generating become Iraqi dinar value fixed and stable, noting that" the attempt to control the value of the local currency by auction where a big risk " . Moussawi continued, "The dominance of the oil sector on all other sectors of the economy made it useless and influenced the level of the economy in the country." Stressing the need to "be directed oil revenues towards the development of other economic sectors to contribute to strengthening the economy and raise the value of the currency."